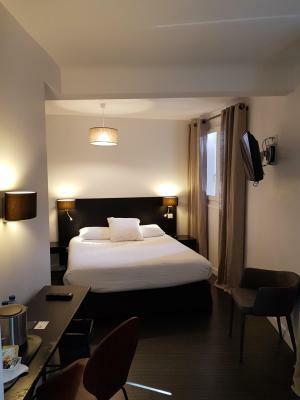 Lock in a great price for Hôtel Au Bon Coin – rated 9.3 by recent guests! The rooms seemed New and hip. Owners were so nice and helpful. Location in a quiet nice neighborhood. Room was excellent, great view ocean, roomy, VERY clean and comfortable. Staff amazingly friendly and always helpful. Breakfast adequate with express breakfast perfect. Family owned and they care about travelers staying with them. Distance from city center short walk down main street with lots of shopping and restaurant options. 15 minute walk to beach. Will definitely book again if we return. Staff was incredibly kind and helpful- this is the best part of this hotel. They did everything they could to accomodate us. 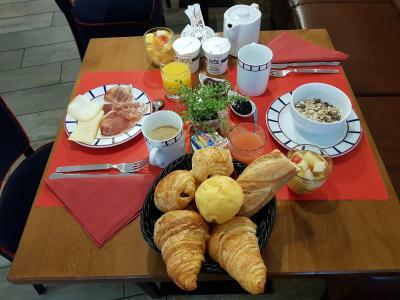 The breakfast was delicious, small selection but everything was good and fresh. The rooms were very clean, quiet considering the area and very stylish. Really loved the toys available in the reception, so convenient with the small children. 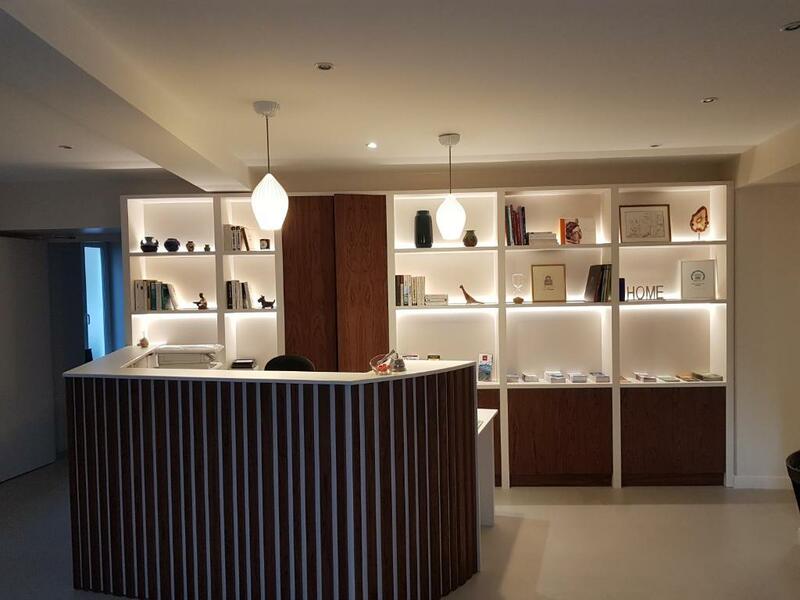 The staff was super friendly and really made you feel as part of their home, as they like to call their hotel. They serve the Best croissants at breakfast in town! The hotel was a little walk from the central tourist area which we liked as we were a part of a quiet neighborhood. Enjoyed a nice sunset over the Atlantic from the roof terrace. Small hotel in San Sebastian. Nice staff, easy check-in. Really cute attic room (light and airy) with 2 twin beds, nice bathroom (great shower) and lots of cute little touches. Recently updated. Room had windows with flowers outside. Hot tub but we did not use. Quick walk to main sites. We liked staying here. 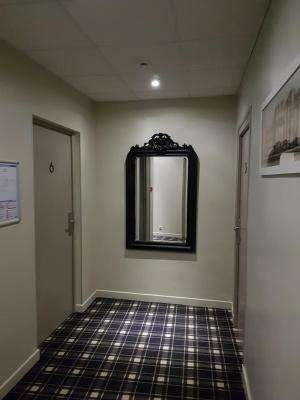 Quiet location in a residential area. Clean room and comfortable bed. The staff was very friendly, welcoming and helpful. The hotel room was good and quite clean when we arrived. The neighborhood is quiet and in walking distance from the city center. Very comfortable. 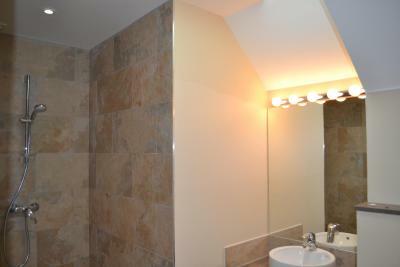 Bathroom and shower were exceptionally good - well designed and attractive. The bed was comfortable and there were many interesting touches in the room and in the hotel. The air conditioning was was very welcome as it was extremely hot in Biarritz. Short walk to beach in quiet area. We had room 15 and it had a view of the water. Very comfortable bed. Lift available. 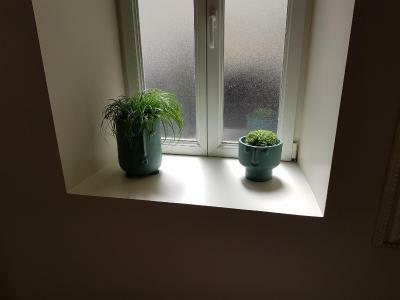 Very accomodating owners. Lovely, modern and very clean. One of our top picks in Biarritz – and a guest favorite. 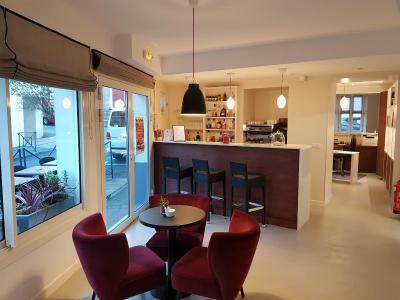 Set 1,300 feet from the sea front and the beach La Grande Plage in Biarritz, Au Bon Coin offers a bar, elevator, terrace and free WiFi throughout. 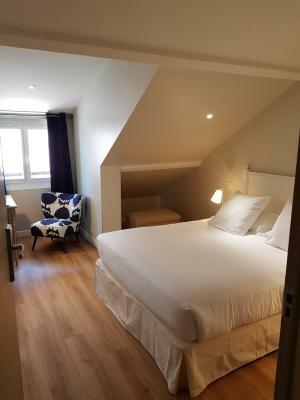 The soundproofed rooms and suite at Au Bon Coin feature a flat-screen TV with Canal+ and BBC channels, and a private bathroom with free toiletries and a walk-in shower. The suite also offers a view of the sea. 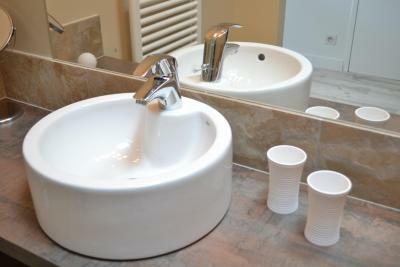 Rooms suitable for guests with reduced mobility are also available. 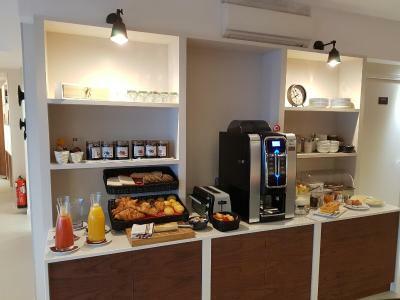 The buffet breakfast is available daily and includes tea, coffee, hot chocolate, fruit, bread, French pastries, cheese, ham, fruit juices, yogurts and eggs. 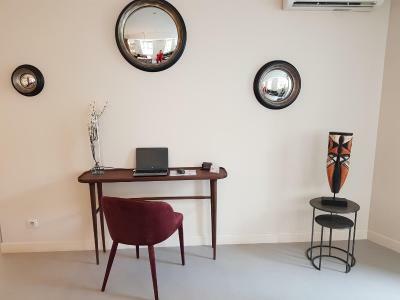 Au Bon Coin is 1,000 feet from the city center and Biarritz Airport is 1.9 mi away. Bike and surfboard storage is available on site. 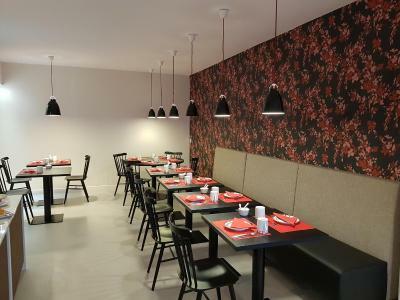 As an environment friendly property, Au Bon Coin received the European Ecolabel certification. 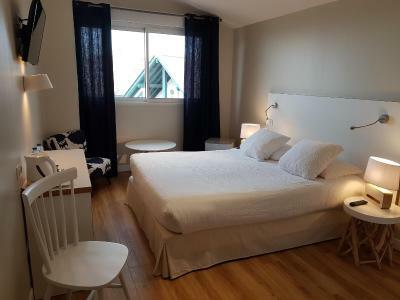 This property is also rated for the best value in Biarritz! Guests are getting more for their money when compared to other properties in this city. When would you like to stay at Hôtel Au Bon Coin? The soundproofed room features a flat-screen TV with cable channels, and a private bathroom with a walk-in shower and free toiletries. The soundproofed suite features a view of the sea, a flat-screen TV with cable channels, and a private bathroom with free toiletries. 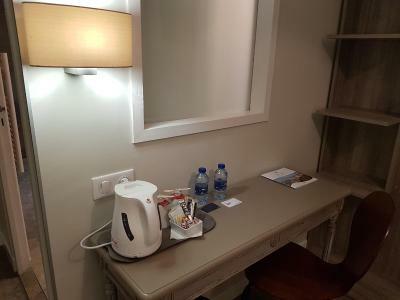 This room has a desk, wardrobe and bathroom with Italian shower and hairdryer. 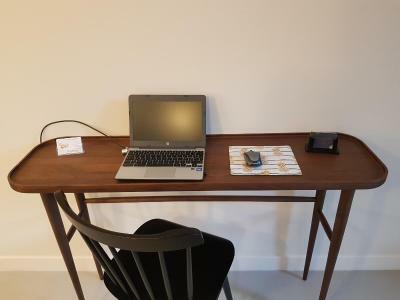 It also features a flat-screen TV, phone and free Wi-Fi. This quadruple room has a soundproofing, flat-screen TV and electric kettle. 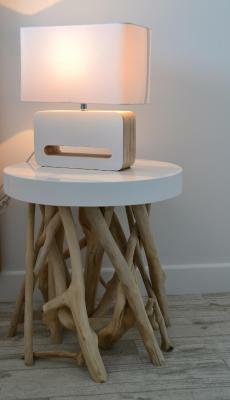 House Rules Hôtel Au Bon Coin takes special requests – add in the next step! Hôtel Au Bon Coin accepts these cards and reserves the right to temporarily hold an amount prior to arrival. If you plan on arriving after 20:00, please notify the property in advance. Contact details can be found on the booking confirmation. Perfect little hotel a short walk from beach ... very comfortable, quiet and lovely hosts. Hotel in a quiet location. Rooms are small but very clean and comfortable. Good hair dryer. Comfortable bed. Good access to the airport (bus stop is on a nearby street). The town and the seaside are within walking distance. The district is quiet, safe, close to a food shop, bakery, Wine Tavern, several restaurants. Pleasant Staff. We arrived in a rain storm, soaking wet, on a motorbike, and they were completely unfazed and welcoming despite us dripping on their floor! Our bathroom was big enough for us to dry all our kit, and we had a wonderful wet, wild and windy walk along the seafront! Later opening of the bar so guests could have a drink later in the evening. More information in rooms about the area. Friendly and helpful staff. Comfortable bed. Lovely bathroom. 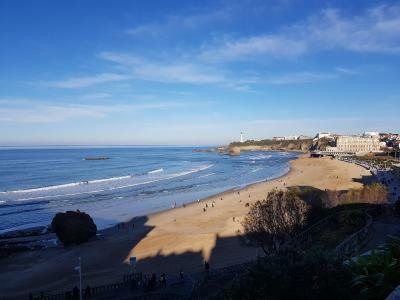 Good location for seeing the sights of Biarritz. The charge for a full breakfast, which really wasn't. The carpet in the room looked like wood flooring but could have used a shampooing. 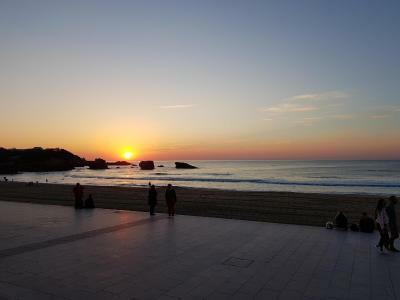 The location within Biarritz is very convenient. It is a short walk to the ocean along streets with a great selection of shops and restaurants. In the other direction, the neighborhood is quiet and full of lovely homes. It is a 10 minute drive to the airport. This is a "typical" hotel with lobby, elevator, and generic hotel rooms. However, the bright beach colors added a happy pop. The room had a small refrigerator and a large walk-in shower. My room was also high enough that I had a nice view over the rooftops to the ocean. I wish the window had been lower so I could have seen the ocean from the bed. The new owner (since June 2018) is a lovely person and was extremely helpful. Breakfast was either a continental for no charge or a full buffet for $12. The full buffet only added a choice of fruit cups and cereal, not worth $12 certainly. As a one night stay before a flight home, it was perfect. 5 min walk to busy area of town but didn't mind that. The greeting and information given by the owner was excellent. While taking a shower, some water left the room. Wifi connectivity is not optimal, at least in the first floor. 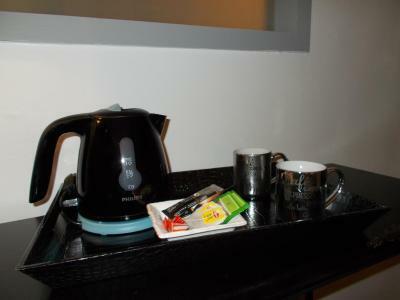 Nice and sweet hotel, with great personality and attention from the staff. Nice location, between the bus stop and the beach (7 min walk from both). The continental breakfast was just perfect as well as the bed. Convenience of location. 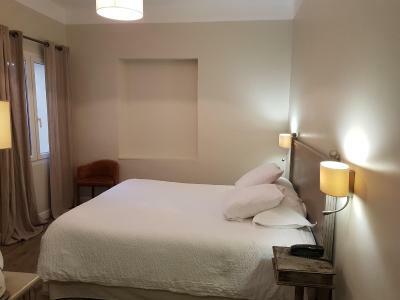 Beautifully quiet and comfortable rooms. Helpful and friendly hosts. Water tend to spray out of shower and wet the floor. Very friendly, competent and helpful staff.